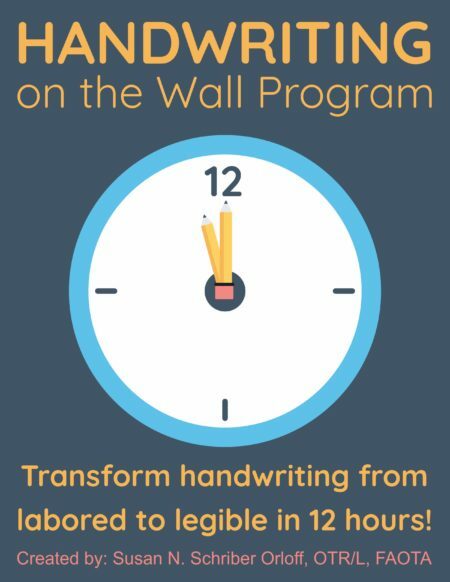 Transform labored handwriting into legible handwriting with this 12-hour Handwriting on the Wall Program. 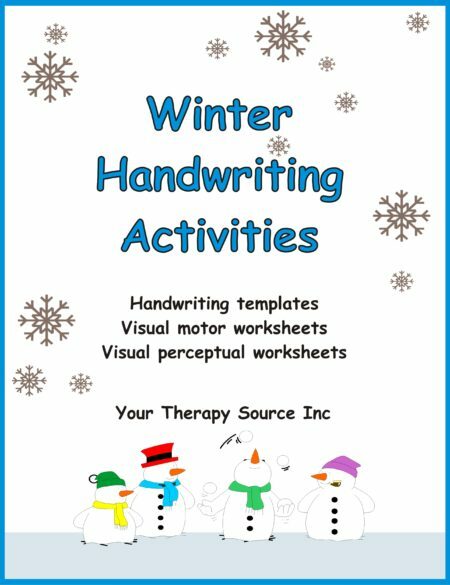 This digital download was created by an Occupational Therapist with years of experience. 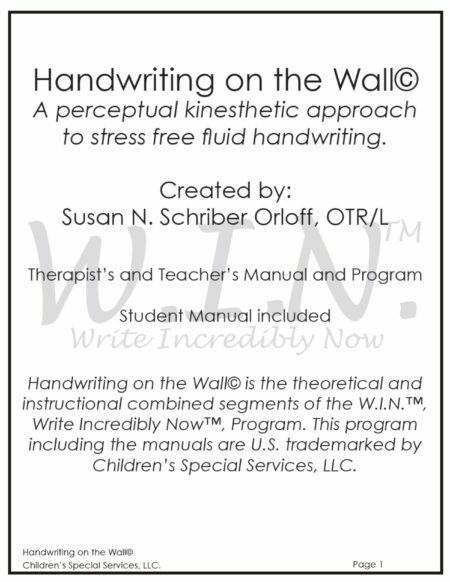 The Handwriting on the Wall program © is the theoretical and instructional combined segments of the Write Incredibly Now™ program which is an exclusive U.S. trademarked handwriting program of Children’s Special Services, LLC and designed by Susan N. Schriber Orloff, OTR/L! It breaks manuscript into three forms and cursive into four using colors instead of directional cues, as well as gross and fine motor games. 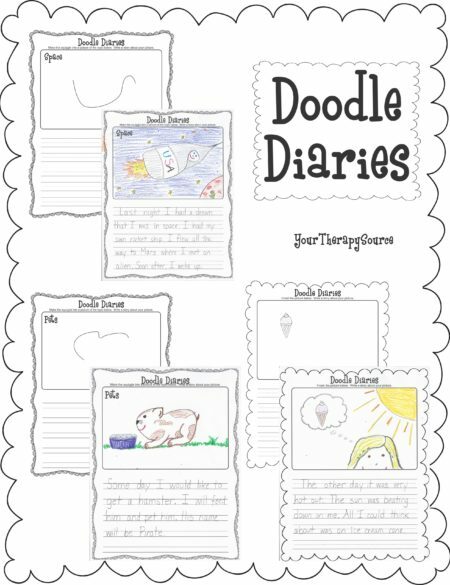 You get both the manuscript and the cursive programs in reusable workbook form for multiple use. There are games, activities and follow-up suggestions so that the child can individually continue the program after the 12 hours are “over”. There is plenty of room to add your own creativity too!! 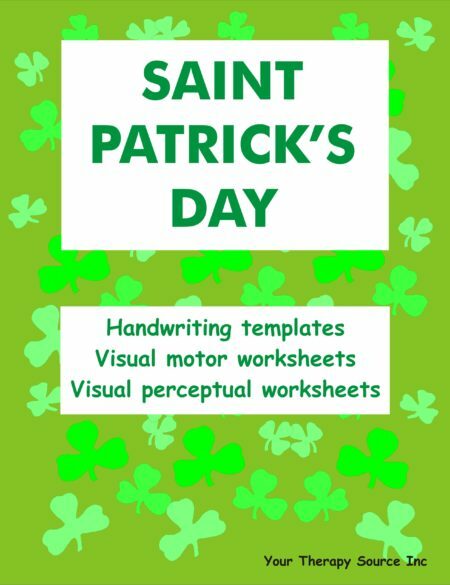 Helps with children who have visual processing issues such as dyslexia, dysgraphia, etc. Materials used are easy to purchase from local stores such as Target, Wal-Mart, etc. Separate pdf download is included so that the program can be explained to teachers and parents. 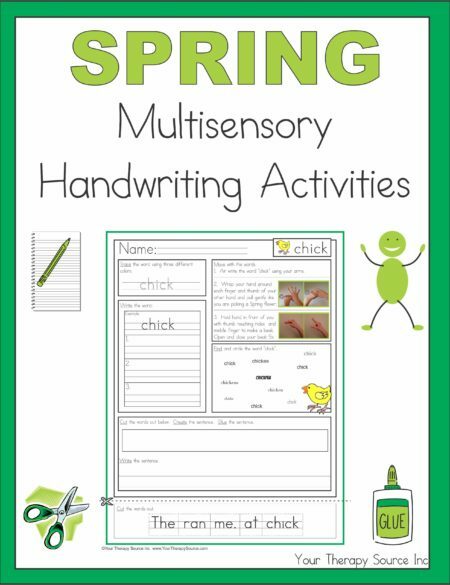 Can be used by occupational therapists, certified occupational therapy assistants, teachers, etc. 1. What are the goals of the Handwriting on the Wall© program? 2. Who is currently using this program? 3. 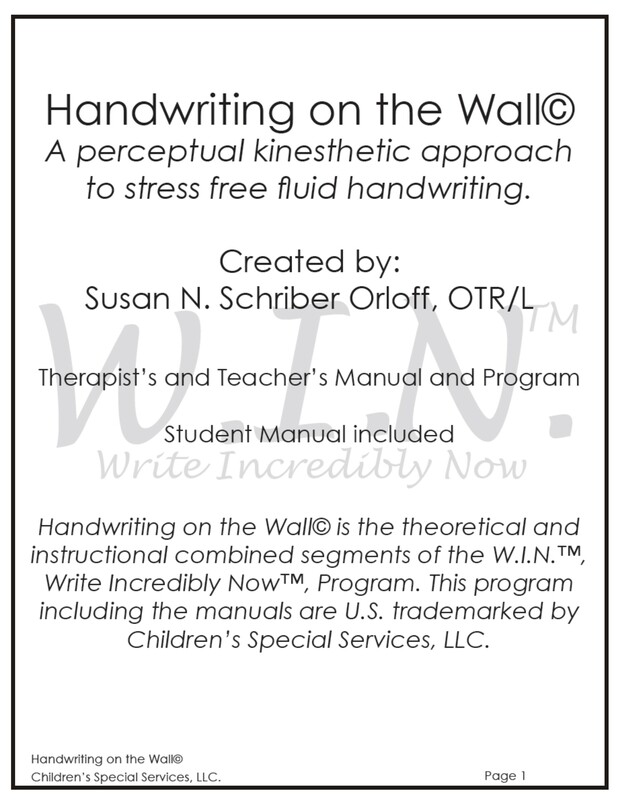 What makes the Handwriting on the Wall© program different from other programs such as Handwriting without Tears, First Strokes or Loops and Groups? Basically, all these other programs are trace write and repeat programs. With the Handwriting on the Wall© program child does not write a letter until all basic shapes and flow patterns and secure and then the shapes are combined to make the letters. 4. How long is the Handwriting on the Wall© program? 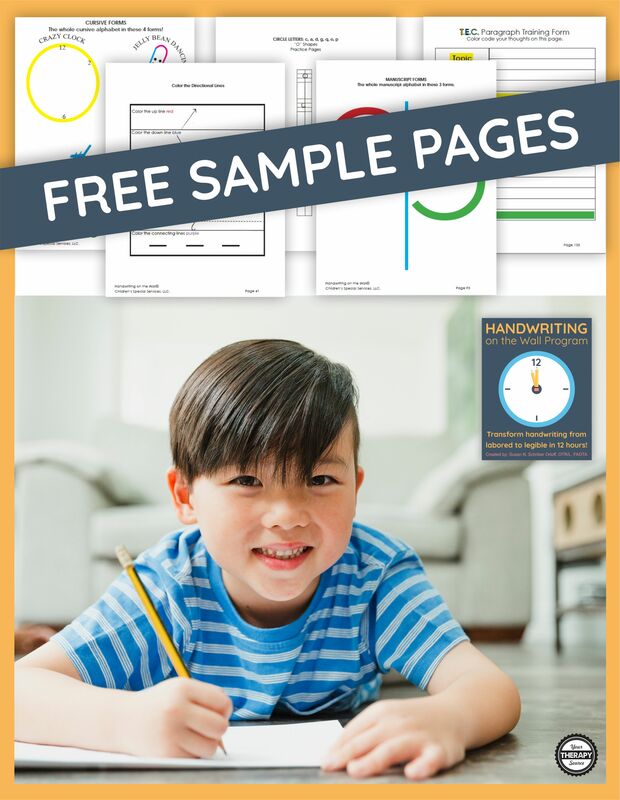 Handwriting goes from labored to legible in 12 hours! 5. What is the age range for the Handwriting on the Wall© program? It has been used on children 41/2- to adult. For adults, one may choose not to use the picture analogies. 7. Can I view some sample pages? Yes, you can view sample pages. Sign up to receive the weekly email newsletter from Your Therapy Source to gain access to 5 FREE sample pages.